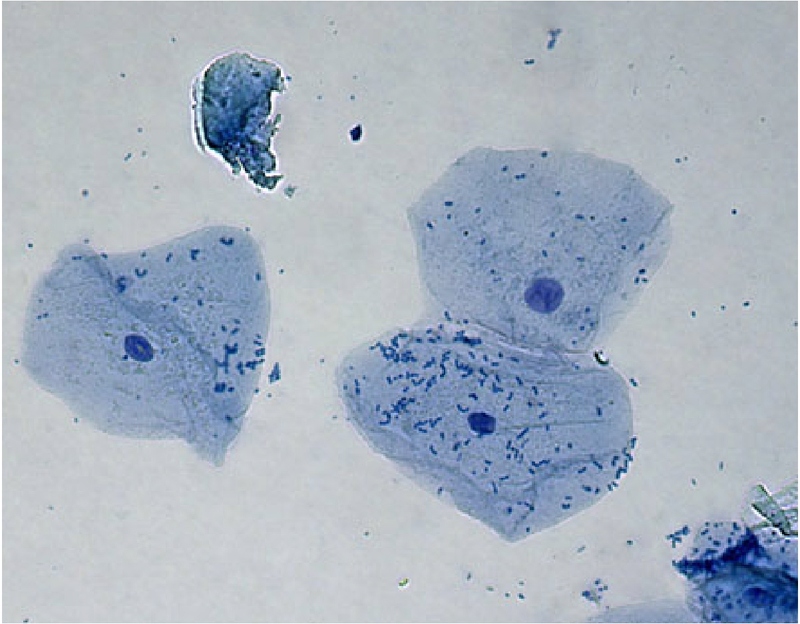 Stained microscopic photograph depicting an instance of SCP-1809-1 inspecting three (3) connective mast cells. Special Containment Procedures: SCP-1809-A is to be housed within a containment cell furnished suitably as a living area. Item requests are to reviewed prior to approval or denial. The cell is to be monitored, and all regurgitations and/or excretions are to be analysed prior to disposal or storage. SCP-1809-A is to be fed twice daily as per Protocol SF-01. Microscopic analysis is to be conducted within a separate area in which individual instances of SCP-1809-1 may be observed and/or extracted. Description: SCP-1809 is a collective of sapient microscopic organisms inhabiting cytoplasms within most permanent and quiescent cell types within a human male, ████ █████████ (referred to as SCP-1809-A). SCP-1809 is a former arborist with no professional links to cellular biology, cellular experimentation or other possible origin for SCP-1809's effect; SCP-1809-A claims to have been entirely oblivious to SCP-1809 inhabitants prior to discovery. SCP-1809 was discovered following SCP-1809-A's apparently unrelated skin cancer resulting in a cellular defect, to which a specialist private cancer treatment facility was referred, healing the impairment; SCP-1809 was discovered during a follow-up microscopic analysis of the affected area, in which the surrounding unaffected cells exhibited anomalies later identified as instances of SCP-1809-1. SCP-1809-1, the individual microscopic inhabitants of SCP-1809-A, resemble exoskeletal crustaceans. Instances of SCP-1809-1 emit intermittent pulsations of light from within an interior source; extensive observation reveals SCP-1809-1 to be constantly communicating via morse code. Topics of conversation primarily consist of the wellbeing of SCP-1809-A (referred to as "Him" or "He" between SCP-1809-1) and "quality of life" between individual instances (see Addendum). Despite this, language analysis has proven difficult due to extensive time taken to emit light pulsations. When a cell is selected, SCP-1809-1 will attempt to penetrate the cell membrane, invariably allowing for a safe opening to within, in such a manner so as to prevent lysis. Once inside, SCP-1809-1 will attempt to rearrange all internal subcellular organelles such as nuclei, without physically harming the cell interior. Following this, SCP-1809-1 will remain in a dormant and immobile state unless physically interacted with. Instances of SCP-1809-1 are asexual and do not appear to require sustenance. Further analysis of SCP-1809-1's behavioural patterns is yet to be conducted. Addendum 1809-01: Morse translation of a conversation between two (2) instances of SCP-1809-1 inspecting a neuron. He's fine. No illnesses as far as I can tell. What d'you think? Is this one to your liking? Very much so. In fact, this is among the best. Indeed. And of course, such a fine view of the nervous system from the axon terminals is irresistible, is it not? I'll take it. I can't resist those dendrites. Sir, you have yourself a deal. Note: One (1) instance of SCP-1809-1 included within the above conversation remained within the neuron for three (3) days prior to the appearance of five (5) larger instances of SCP-1809-1, all of which appeared to physically enforce the removal of the first instance from the cell. The Finest Quality Keratin - Polished and Ready-Installed. Available Now! Trichocyte Cells! A Truly Unique Mobile Blood Cell - Hurry While The Price Is Low! Complete with a bowl-shaped exterior and excellent quality pigmentation. Suitable for the working-class. Have you ever considered a mobile home? Read no further! You've come to the right cellular housing directory! Note: Our company and our associates are not responsible for the causation of sickle cell anaemia or any other form of haematological blood cell-affecting outbreak within your newly purchased mobile home. In the event of a home-affecting outbreak within your area following purchase, contact your cell insurance agent.